Three and a half years ago when I started this blog, I thought it would be our blog, & it is ours, but I thought that we'd take turns writing posts...and both be contributing writers if you will! I guess this is my first official blog post. I haven’t really felt the need since my wife does such a wonderful job of documenting the big events, & the small ones for that matter. I decided to do this post mostly for others that are looking for any information on Central Serous Retinopathy. April 2nd, I distinctly remember having issues with my depth perception. I dismissed it to the weird patterns the late snow melt had left on the lawns. It had happened a few times so I mentioned it to Darcie, but didn’t think much more about it. 2 days later I was back at work, & I immediately noticed that my monitor didn’t look quite right. Out of curiosity, I covered my eyes one at a time to see what would happen. When I covered my right eye, I could tell everything was blurry and smaller. I figured that perhaps I needed glasses, however, the one weird thing I noticed was that colors didn’t even look the same. Well, I’ve never needed glasses or contacts, so that must fix all of that right?!? 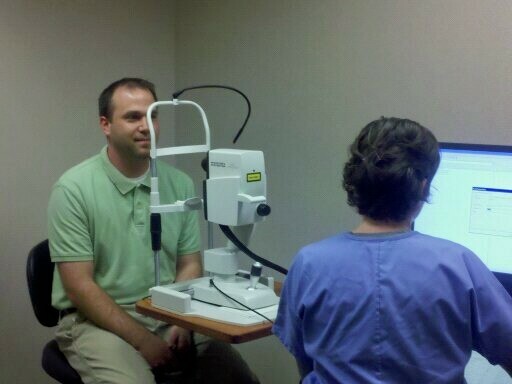 Fast forward to Friday of that week where I found myself having my first eye exam ever. (If you don’t count the ones they give you at the DMV that is) At age… um early 30’s??? Ok, I guess 34 in case someone is actually reading this for research. My first eye exam. I tried reading the lines… right eye perfect 20/20 – left eye not so much. They tried different lenses, different sizes & even different colors. No go, still couldn’t see. The eye doctor takes a peek into my dilated eye balls and says something like "Well I see some fluid in there & your other symptoms sound like you have Central Serous Retinopathy." He wanted me to see a specialist, but no big hurry. This condition can last a few months and if they persist, can be treated with laser surgery. Ok, I'm thinking, I will try not to panic since I can’t see out of my eye & seeing as how my employment consists of looking at a computer screen all day writing queries and trying to identify things as mundane as one character that is out of place. Darcie was trying not to worry about the things she sees come across her desk every day, you know, things like tumors behind the eye and other not-so-fun stuff. Lucky me, they could get me in the following Monday. I go from no exams to having them on back to back working days. I guess the VitreoRetinal Specialists don’t mess around either cause their drops sting & my eyes were dilated in seconds, not minutes. And...they stayed that way for a couple of days! They did the same reading tests as the regular eye doc & a few new tricks. 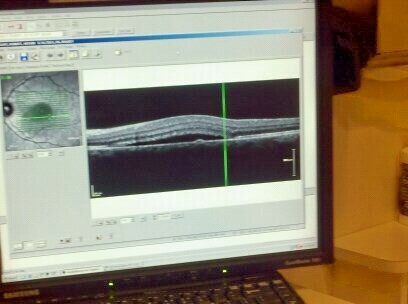 First, I had a type of scan where they took a look at the different layers of the eye. Cool enough. The Vitreoretinal Surgeon confirms the CSR (Central Serous Retinopathy) diagnosis. He then shows me the scans of my good eye and bad eye. Good eye looks like a flat line with a little dip in the middle. Bad eye looks like a giant mountain – far from being flat due to the fluid that has pushed it up. Well, just for fun let’s do the dye test. I was expecting this since it was mentioned in all the material on CSR that I read – as little as there was. 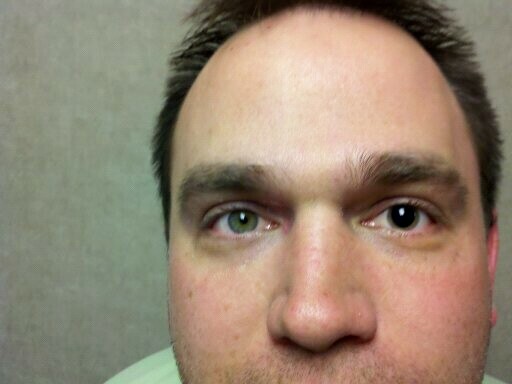 Now comes the injection of the fluorescent dye that will show up in the photos of my eye. The dye will show the specialist where my eye is leaking. Lucky for me – I was a “young” person so they were going to just give me a half dose. The nice thing is that it would be less time to work through the system. They warned me that my urine would be bright florescent yellow, and they weren’t kidding. (To date, that has been the coolest part!) So, they inject the orange dye & then take pictures of the eye a couple times each minute tracking the changes. These pictures have a flash, so there was a little bit of sensitivity having a few dozen pics of my eyes done about ¼ inch from the pupil. The pictures come back from the dye test. My least favorite comment comes out of dr’s mouth “oh, this is interesting” – I’m pretty freaked out at this point. Turns out I have not one leak, but two leaks. Great, now I have two spots to worry about! So now what? Treatment. Same as what I had heard before. 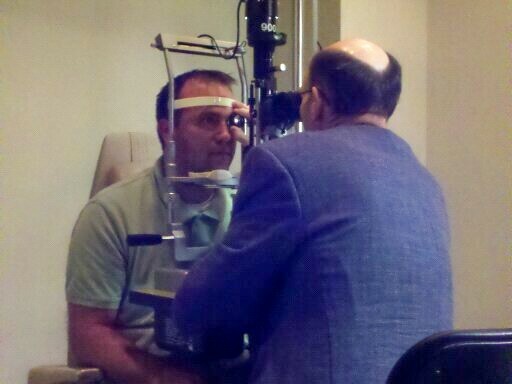 Laser is possible and luckily where my retinal leaks are, I am a good candidate for laser surgery. I guess some spots are in a place where they can’t be worked on via laser surgery. For many cases this will heal on its own, but could take a month or three. So, go home and don’t worry about it and go on with your life. No restrictions, no medicine, no PT, nothing. I started a diary to track the changes. The only articles I had seen on-line were mostly jaded individuals that had waited too long to have their eyes looked at or had other issues I don’t know. The little bit of research I did, sounded like if the retina is separated by the fluid for too long (several months) the retina itself will become damaged and even after laser surgery full version can not be restored. Of course, laser surgery itself has its own risk, but at some point it becomes a needed procedure to save the retina. The diary of my changes became very repetitive. Then I went to weekly and “no change” have been my only entries. I can say the days following my second eye exam my vision was the worst it has ever been. I don’t know if the CSR was the cause or the exams or both. My vision near & far was blurry & distorted. Slowly that improved to about the point it was before I went into my first exam. Work was a bit difficult to adjust to. After a few days I decided that it would be worth trying to increase the font on the monitor. That has seemed to help greatly. The only time I really notice the CSR symptoms is when I try to focus on small (aka, regular) print. Novels, newspapers, pc, etc. Why do the waiting room in the eye doctor's offices offer one million magazines that I can’t read while waiting with my dilated eyes? Maybe a TV or some headphones or something. Or at least a magnifying glass as I wait an hour (or longer) to see my dr. The Vitreoretinal Surgeon had said to come back on May 16th if my vision wasn’t symptom free. I was so hoping that I would not have to go back. As the date got closer, it became evident that this second visit was going to happen. This visit went much better. 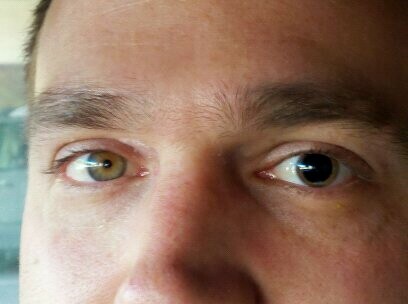 They only focused on my bad eye, so only that one needed to be dilated. I also didn’t need to do the dye test. A quick eye exam (which I felt like I did better than the last time) & then over to do the scan to see how much fluid was under the retina. They loaded the pictures in the computer and then could even display the two scans (from my first visit and today's visit) at the same time with the changes highlighted in color. I could see plenty of green which displayed any areas that had a decrease in fluid. Yea! In my novice opinion, it looked to be about a 30 percent decrease. The dr discussed laser treatment. I am a candidate and it could have been done to speed the healing process. Although, it is still recommended at this time to try let it heal on its own, as long as I am getting along ok with my everyday activities. I have been doing okay, and with today's report of progress I am comfortable waiting another 5 weeks to see if it heals up on its own! I was hoping to save the post until I was 100% healthy, but it’s clear that it can & most likely will, take several more weeks. And since there hasn’t been much visible progress, I don’t think there will be any more updates until I can see again. I don’t know if it will be spontaneous or gradual, and the doc wasn’t able to tell me much more either. Everybody is different and every case is different, blah blah blah. So there you have it, more than you ever wanted to know about Central Serous Retinopathy, for those of you who may be looking for info like we were! never heard of this condition....VERY interesting. So glad they are following you closely and that 'some' positive progress has been made. Hoping you can stay away from the laser surgery. first, I don't ever want to see the pick of that giant pupil again. Yuck!! Second, I'm glad you have such a positive attitude with this. You seem much more patient than I ever would be. I hope it heals on its own, but if not, I'm glad they're so positive about laser surgery. Good luck. I love that it is getting better, even if it is slowly. Eye stuff takes time. I had a bleed and it took forever to heal, but in time it did! And that flash picture thing...horrific! I hated that the most. Hope it keeps getting better! Hi There. What a great description of a swift diagnosis. I am a long-time CSR guy - about 8 or 9 years in and as a photographer/designer with hobbies like astronomy and ornithology my eyes are pretty central to my work. With me it's reoccurring but entirely liveable-with. After a while you marvel at the brain's interpretive powers, vision seems to change daily-or hourly at first. You can join a great yahoo csr group here: health.groups.yahoo.com/group/csreye/ and there are lot's of us worldwide with stories and tips to share. I found your blog entry because I have a twitter search column for CSR.The key thing is to maybe take a look at stress levels in general, chemical stress from your caffeine intake or medicinal steroids maybe, and environmental stress at work - and don't over exercise or work out insanely to "get fit", all these things raise Cortisol levels and this seems to be a key indicator or common marker in those with CSR. I am in the UK and have benefitted from some great advice. My CSR is right in the centre of my eye(s) and can't be lasered without causing damage. Good luck and keep blogging about it and maybe more folk like me will pass by to wish you well! Mark Edwards - London UK. Mark, I have been recently diagnosed with CSR. At first i panicked and then visited my GP and Eye hospital in a hurry. It’s been 3 weeks and 3 days since the condition started. I have been trying to read about CSR and came across your comment on this blog. i have similar condition as yours i mean SCR is in the central part of my right eye. I am very curious to know what is the current status of your vision as you are a long term sufferer. Your help will be much appriciated. 5 days now I had this CSR I went twice dilated my eyes & dye examine & the doctor said wait a month then come back & follow up check up & I don't think I'm going back it was a wasting time to examine & didn't give me any antibiotic to cure the fluid in the back of my right eye, & for sure I would not take any laser cuz could ruin your eye sight & permanent damage of your eye the rest of your life so just I would just take it easy relax & take more eye vitamins & stay happy. The doctor would not release any medication cuz they want people to come back again to do eye exam which is the same thing & not going to help the CSR problem . Hope this help you guys to be smart ! Everything is back to normal for now. Took 6~9 months or so, but all normal eye exams since then! CSR Day number 5- Noticed some vision loss and distortion the other day when driving after covering one eye then the other. The next day went to eye doc and another for a 2nd opinion. I was diagnosed with CSR and light stages of Glaucoma, but wait!..... im only 38!!.. (That rhymed) Doc said main reasons for CSR where stress caffeine and steroids. I do drink coffee a lot but im not that stressed and steroids, not a chance. Then doc said " or a TYPE A personality." I said freak no doc! what are you crazy! not me....(yeah right, i covered about 4 of the traits in front of him in the office). He said you need to relax. Vision in my left eye(bad eye) is shaded and colors are off distorted and I can't seem to see anything when looking directly at it when my right eye is covered as if I just looked into a very bright light after being in the dark. However my peripheral vision in my left eye is good on the left side of my left eye and not to good on the right of my left eye. When both eyes are uncovered distant images occur very blurry or smeared mid distance images seem a little more clear but still blurry and closer images seem a little blurry but seem see light patches in vision or images in front of my face seems if im troubling to focus. Doctor said it may be occurring in the right eye also based on the number of scans and tests that were done with dilated eye. Doc said would take 3 to 6 months to heal on its own and no other treatments at this time. One concern in addition to of course many, is that i cant stop working out. I keep active with calisthenics(push ups pull ups, abs and squats). Run sometimes 3 to 5 miles at a clip without any issue and thinking back now at the last time i ran i remember having blurred vision as well as seeing my vision pulse with my speeding heart beat and escalated pressure. What im doing about this-I'm meeting with a holistic doctor in 2 days which may be the first of 4 or 5 sessions who's a close friend and moving to a juicing regimen which i'm not foreign to in a attempt to resolve my eye issue sooner than 3 to 6 and to hopefully prevent progression if any in my right eye. Its an electro therapy that deals with electro pulse and other words that most aren't familiar with if they're not in this field or dealing with this issue. I would like for others who may have this condition and who have a recommendation for treatment any healing solutions or any information that could inform and educate others about how to prevent cure this issue or if anyone would like to see how my holistic treatment is going in next few days then email me at jncortijo at gmail .com and i will be more than happy to correspond. Thanks for your time and this to shall pass, Stay positive! Was diagnosed with CSR early January 2015. After 8 weeks of on-and-off panic, the fluid was declared resolved by oct on 13 March. Still had lots of symptoms at the follow-up (indeed I still have a faint central scotoma today), so was surprised to find my oct showing resolved fluid. My point is that only the scans can really tell you how well you're doing, so hang in there and keep in touch with your retinal doc. Hello People. Im a 35 year old guy, Type "A" personality. I suddenly had a blurry eye after a night shift at the Casino where I work. Next day I woke up it was worse. I began to have extreme anxiety over this.... Night sweats and generally freaking out. Had an eye exam next day and was diagnosed with CSR. This condition brought on a bout of anxiety like Ive never known, turns out I also have general anxiety disorder too! Anyway I took a few weeks off work and just tried to relax as much as possible. My condition self resolved in about six weeks, just kinda went away suddenly..The OCT scan shows im good now. Going back in one year to get another OCT scan as a check up.